It has been said that America has a leadership vacuum. What that really means is not that there are not leaders, but that the leaders in power often lack the personal integrity and character to lead in a righteous way. This nation has subtly submitted to a progressive cultural transformation that eschews character rather than esteems character. The result is that we, the people who choose people for leadership, no longer value Godly character and integrity. Integrity is ‘uprightness of character, honesty, unimpaired soundness, an unbroken state.’ It speaks of consistent living without guile, ambiguity, or deceit. Men and women of integrity and character are scattered throughout the nation, but when they speak forth their values, they are often belittled because of those values. Many are marginalized in the public view in favor of those who flow with the cultural currents. The people then select men and women lacking integrity, character, and Biblical values, thereby creating the leadership vacuum. A great man of wisdom, Solomon, said that ‘righteousness guards the man of integrity, but wickedness overthrows a sinner‘(Prov. 13:6). Solomon spoke of this in personal terms, but it may also be applicable to a nation. 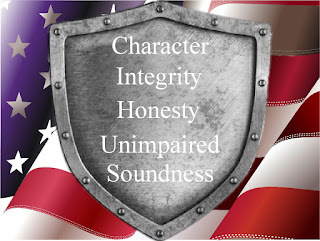 A man, or a nation, is inherently guarded when he walks in integrity. I think of President Museveni of Uganda who in October 2012 eloquently repented and renounced the corrupt and sinful actions of his nation’s past and embraced the righteousness of God for the nation’s future. Museveni’s declaration of a righteous heart toward God on behalf of the nation becomes a guard for that nation. It is a declared public standard that carries spiritual strength against forces of darkness in that nation. His words were pivotal for Uganda. Uganda does not change instantly, but the cultural trajectory of the nation can now change positively. Whereas righteousness guarded many individual Ugandans of integrity, it can now begin to guard a nation of integrity. The character of the nation can then be transformed. I recently read a quote on the wall of a business in my city. In part it said; ‘When looking at the characteristics on how to build your personal life, first comes integrity…..without integrity, motivation is dangerous… I have known some highly motivated and gifted people in business and ministry. In every case, those without strong character traits eventually experienced great destruction in relationships and vocation. Some recovered, embraced Godly character and moved forward. Others languish in the debris of their choices. As believers in Jesus, we have imputed righteousness through God’s grace on the inside of us. That righteousness is available for us to employ in our life decisions. It is available to transform our minds and hearts into the image of Christ-like leadership; a kind of leadership that fills the vacuum of Godly leadership we so desire. Whether you lead people in America or beyond our shores, embrace the righteousness of Christ in you, embrace its character and integrity, and fill the vacuum of leadership around you.